Disney’s Hilton Head Island Resort doesn’t have a ton of food options, especially in the off season. The resort’s main dining stop, Tide Me Over, is a quick service window that provides breakfast staples and a fine assortment of lunch offerings. Its hours are limited, making dinner a self-prepared or off-site affair. However, it does have a fair amount of snacks, both hot and cold, that guests can partake in. One such snack, the Halloween Mickey Waffle Sundae, is definitely a seasonal affair. 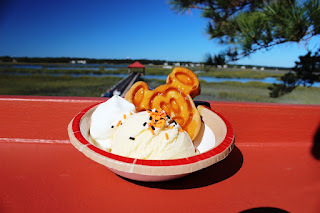 The bowl comes with a scoop of vanilla bean ice cream, a healthy dollop of whipped cream, a miniature Mickey waffle smothered in caramel syrup, and then the whole thing is topped with a handful of Halloween sprinkles (including some that are pumpkin shaped with bats cut out of them). The Halloween Mickey Waffle Sundae isn’t going to be earth shattering to anyone, but it is a well put together treat. The vanilla and caramel pair well and definitely have the hint of fall you’re looking for. Mickey waffles are always a welcomed sight, no matter what meal they’re present for, and the fact that they are warm is a plus. I was expecting the sundae to utilize soft serve, which has become common for floats and sundaes around the parks and resorts, save for those dedicated ice cream parlors scattered about. The fact that they utilize real ice cream is a definite win for the treat. The serving size is perfect for a mid-afternoon snack, and it won’t break the bank or the appetite for dinner. Now, unless you are at Disney’s Hilton Head Island Resort today, this review probably isn’t going to be very helpful. However, this type of seasonal offering from Tide Me Over, in addition to an assortment of specialty coffees, was new to us on our most recent trip. It stands to reason that they will likely continue to add these types of items to their menu throughout the year, such as the holiday season coming up. For those of you visiting in the future, keep an eye out, and know that these small sundaes are great snacks for you and your family.